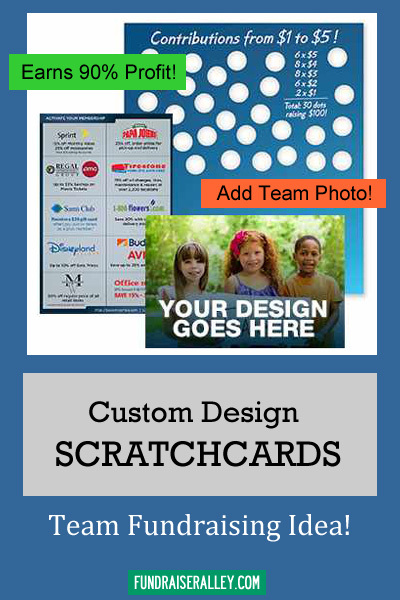 Custom Scratchcards are unique in that they can be personalized with your own group or team photo. Not only that, they are a high profit fundraiser, earning 80% profit. Each card cost $20 and earns $100 if all dots are scratched and contributions made. Plus, you receive 10% bonus scratchcards for every 10 you order. This increases you profit to 90%. Shipping is FREE, so that does not take away from your earnings. This is a popular product for sports teams, clubs, and small groups, as well as schools and churches. If you need to earn funds quickly, you should consider this one. Your group photo on each card! We recommend ordering 1 scratchcard per participant. The custom scratchcards have your own personal group or team photo and name on the front flap. If you do not have a photo, you can order our regular Scratchcards. High Profit Fundraiser for Your School or Group! 30 Dot Custom Scatchcards Earn Up to 90% Profit. Each card will earn 80% profit when all dots are scratched. Plus, if you order 10 or more cards, you’ll get 10% free cards, earning you 90% profit! 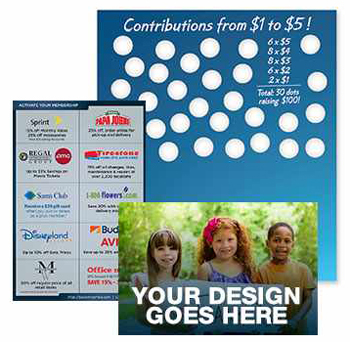 Each supporter receives a valuable brand name coupon sheet for his or her donation. 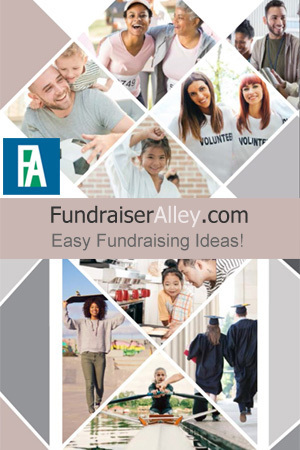 Coupons are from national retailers including Pizza Hut, A&W, major movie theater chains and more to ensure that your supporters are motivated to help your group have a successful fundraising campaign. You will receive 10% FREE Bonus cards for every 10 cards you order. How Does a Scratchcard Fundraiser Work? 1. SCRATCH – Every participant in your group is given one Scratchcard. Each card has the potential to raise $100. Participants invite supporters to scratch off one or more of the 30 colored circles on the card. 2. DONATE – Supporters donate the amount of money that was revealed beneath the scratch off dots. Donation amounts range from $1.00 to $5.00. 3. RECEIVE – Everyone who donates receives a coupon sheet as a thank you gift. These coupons are offered by some of the most popular national retailers and restaurants in the United States. The scratchcard fundraiser offers free shipping with minimum order! Allow about 7 business days for delivery of your scratchcards once order is placed and payment is received. There are several options of payment. If you are ordering online, you can pay by major credit card, Pay Pal, or School Purchase Order. If by mail, you can also use a check, money order, or certified check. Scratchcards are a favorite fundraising idea for sports teams, clubs and groups because they can be personalized with your own group photo. Not only do they earn a high profit, but they are easy and fun to do. No worries about product storage or delivery. No worries about tallying up order totals or sending in orders. Simply order one scratchcard for each participant and hand them out after they arrive. When that participant has all of the circles on their card scratched, they turn in the money earned. And, that’s all it is to it! After all dots are scratched, participants turn in earnings.